Today’s pop quiz! What do the following have in common? 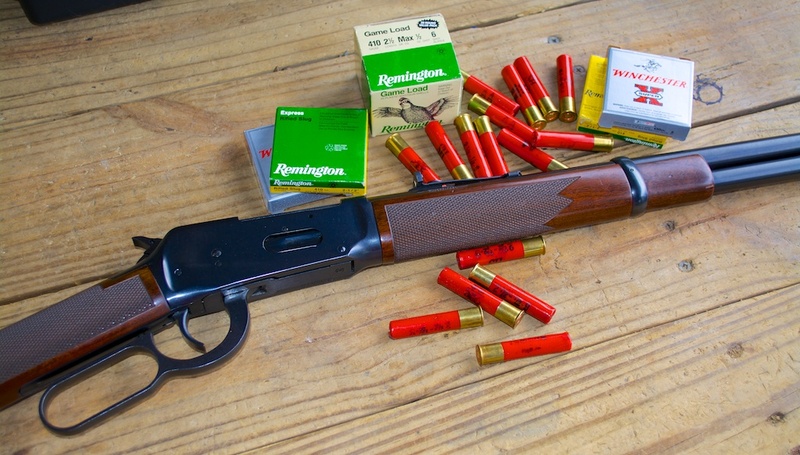 It’s the Winchester 9410 lever-action shotgun! No, the goofball who took this photo was not high on black powder residue. Why, that’s a Winchester 9410 lever-action shotgun! Admittedly, the Cartwright clan had access to guns from the future, as they shot an awful lot of Winchester 1892’s, which is only two different than the 1894 design we’re talking about here. Close enough. For this pop quiz anyway. Continuing to refine his lever-action designs, John Browning designed the Winchester 1894 in, you guessed it, 1894. It’s one of the most popular rifles in history with over seven million produced between 1894 and 2006, with those made between 1980 and 2006 technically being made by the U.S. Repeating Arms Company under the Winchester brand. While there’s a lot of hoopla about the Saiga “assault shotguns”, one can consider the Winchester 9410 as a predecessor – a manually operated “assault shotgun.” Unlike the Saiga, the biggest thing it’s going to assault is rabbits or clay targets, as long as they’re not too far away. And you can only assault things as fast as you can work the lever- up to ten times without reloading. As you’ve figured out, the Winchester 9410 is closely modeled after the Winchester 1894 rifle, with a few necessary differences. Slender, slick and a natural pointer, the 9410 acts a lot like its ancestor. It’s pure joy to handle and shoot. A couple of the major differences (besides the fact that is’t a freakin’ shotgun!) are a specially designed extractor/ejector for controlled ejection of .410 hulls and a tang-mounted safety added to the ’94 family in 2003.
will it fire the .45 colt also? Oh I wish…. But unfortunately no.